In collaboration with this publication and our own Joël Chevassus, we herewith present a translated syndication of his original French editorial published in May 2014 here. All images are the property of Audiophile Magazine - Ed. It's not easy to categorize our high-fidelity industry. At first one might rank these manufacturers in the same category as video equipment manufacturers. Indeed in all our leisure time, sound and picture appear like a perfectly complementary and logical association. One could also classify our audio consumer goods in the family of technical leisure devices like cameras because they serve a technical discipline that responds equally well to professional and amateur needs and applications. If you think one of these options is better adapted to the small world of our High End, the global economy seems to have decided otherwise. Taking a step back, the area of High Fidelity has become even more fragmented than it was a few years ago. Within our niche market the players are so many yet their machines have mostly disappeared from the shelves of our department stores which stock electronics. One must seriously question the sustainability of this industry. The global economy and the Internet may partly explain this paradox. If you look at the list of exhibitors during the recently concluded Munich High End, you will have an idea of the multitude of players in a market which has become a perfect stranger to the vast majority of households. Indeed, who today still knows what hifi really is? Hifi has become a generic term for basic audio devices and in the everyday life of many just a digital speaker to which you connect your iPod or smartphone. That's the core business of the electronics majors. The mere notion of analogue gear connected with several wires would seem completely archaic to the younger generations. With such a disappointing state of affairs, what should be done for this small industry so it may continue to prosper? The world economy dictates its own laws and the answer seems obvious: manufacturers must increase their margins by positioning themselves in the luxury segment and focus on their growth by merging with or absorbing other players. If hifi does go that way, it might move away from its artisanal cottage industry beginnings. Whilst it takes all types to make the world go ‘round, a globalized economy, changing distribution channels and massive competition make it harder and harder for small entrepreneurs to get ahead. Do those still have a future? The latest and most glaring suggestion to the contrary by way of an example of luxury plus corporate merger was undoubtedly the Fine Sounds Group. The Quadrivio Italian private equity had just divested itself of their hifi business by organizing a LMBO (leveraged management buy-out) with the support of two other private equity funds, LBO France and Yarpa. The new management under the leadership of its charismatic CEO Mauro Grange as a kind of mini Italian Bernard Arnault (the CEO of Louis Vuiton Moet-Hennessy) took the lead over one of the bigger conglomerates of this industry which already consisted of major historical brands Sonus faber, Audio Research, Wadia Digital, McIntosh Laboratories and Sumiko with a combined head count of 270 people. 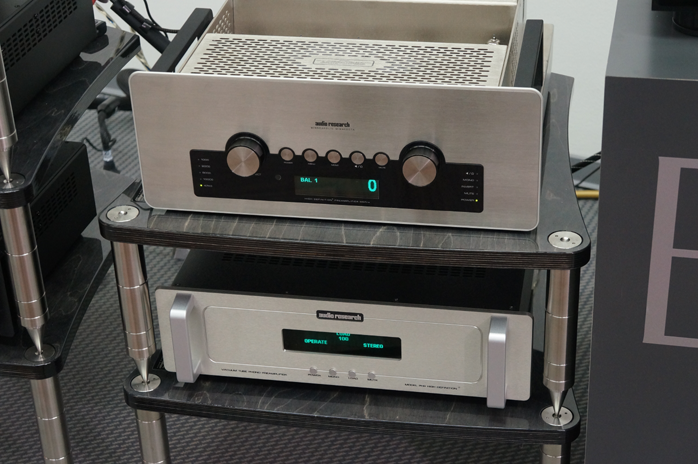 The merger of Fine Sounds with McIntosh Laboratories now redefines ambitious growth in the luxury hifi sector. I let you in on an open secret. Despite being the biggest concentration of brands in our industry since quite a long time, it remains a small merger compared to what I am used to handling. Against my occupational background of mergers and acquisitions in the field of the oil & gas industry, the total amount of $20’000’000 EBITDA for the entire Fine Sounds Group sounds rather insignificant. This number was given by Mauro Grange himself during the press junket at Munich High End. It implies that the previous deals to achieve this concentration of brands were rather small. Even so, in this small world of high-end audio, Fine Sounds looks like a golden calf or white elephant. And this business goes on. Mauro Grange and Charlie Randall (president of McIntosh) explained that they will continue to acquire new high-end brands. To those who believed there was no real money to be made in hifi, this bet seems daring. Yet given the current context, Mauro Grange's strategy is probably most appropriate. After all, the middle class has less and less financial means to acquire these products whilst the wealthy class is on the rise around the world. Ever since high finance took control over the most famous of Italian speaker brands, the development of the top sector became a priority. The cult of branding is a fundamental part of this strategy for getting traction in the luxury sector. It also explains Fine Sounds’ choices of acquisition targets. The cult of lifestyle, appearance and industrial design is another axis for this development. It crescendoed to a noisy peak during Munich's press junket. Who do you think is the most important person at Fine Sounds today? Forget technical engineers or acousticians. From how he was introduced to our community of hifi insiders, this person appears to be industrial designer Livio Cucuzza. No longer is the focus on technical excellence. It is on external elegance. As for Dior or Chanel, the star is the celebrity fashion designer. Livio seems to have become hifi’s Giorgio Armani or Jean-Paul Gaultier. 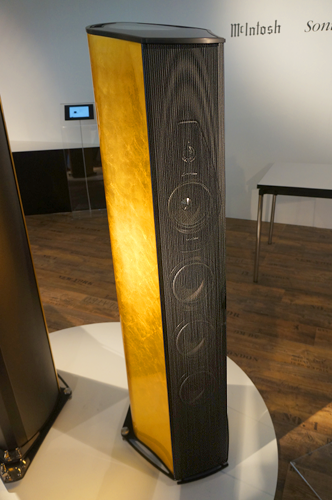 In the same breath I confess that the finish and cosmetics of Sonus faber’s latest Lilium speaker were gorgeous. 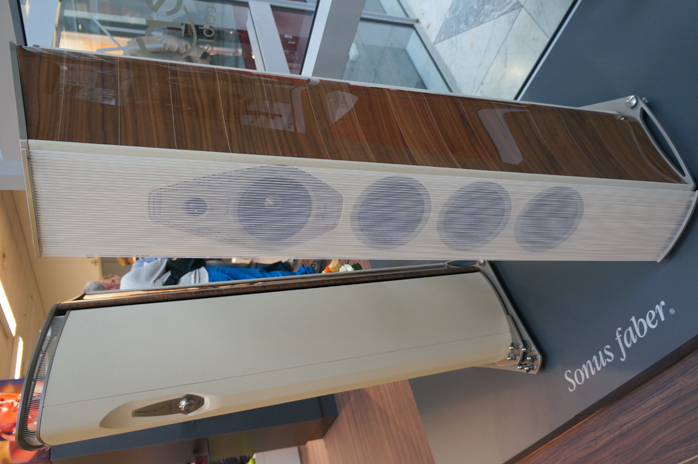 Purely visually this must be one of the most desirable speakers currently available. 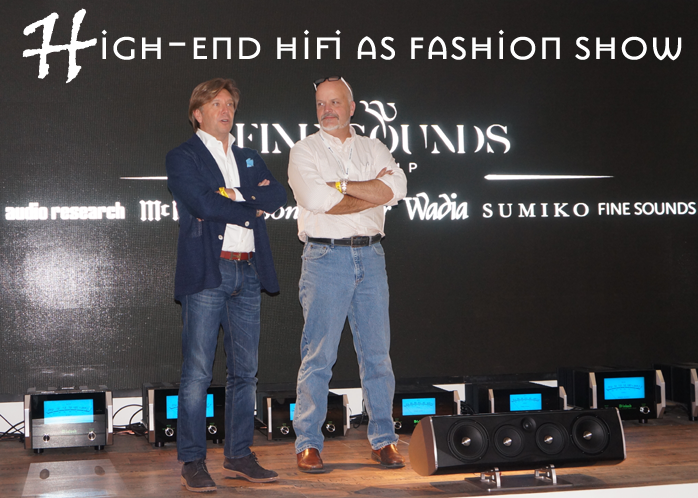 But what kind of added value could hifi reviewers bring to the Fine Sounds Group’s fashion-centric presentation? Our sole contribution as I see it would be beautiful photos shot during the event. Yet how interesting is that really to a conglomerate which can hire the very best professional photographers to promote its products without our coverage? Still more ridiculous was the presentation, via advertising videos, of Audio Research’s new Galileo line ‘designed’ by the same Livio Cucuzza. The entire presentation centred on his cosmetic makeover of ARC’s vintage look. It essentially focused on the design of new bloody face plates for their amps and preamps! This really was a joke. Yet most people present seemed to take it dead serious. The final straw was the slew of photographs of ARC’s new range shot inside a historical Italian building just beneath a painting by Galileo. It reminded us all—or it should have—that we were but part of a fashion show. Paul Messenger sat near me at the beginning of the presentation. He didn’t wait for it to conclude before exiting in disgust. He paraphrased to me in a few sentences what I’m expanding upon here before taking his leave. Forget classic bench-test measurements to quantify and qualify value. In this game, could one objectively compare a Château Latour wine to a Château Pétrus? Or a Breguet watch to a Patek Philip? Here I think our colleague Ken Kessler who covers both hifi and luxury watches is undoubtedly the most visionary amongst us all. Granted, most of us forget about scientific measurements to focus instead on critical listening. But with this new exclusionary fashion focus, should we forget about that as well and purely talk looks and luxury finishing touches? The very wide range of technical audio parameters has always made the assessment of a piece of gear a very subjective expression regardless of what one might think about accompanying measurements. The complexity of a hifi system ties to its many parts which either support or subtract from ‘alchemy’, never mind its unpredictable interaction with our acoustic environments. These interactions are probably a good reason to forget about measurements as reliable predictors of performance. Said that, I do believe that it is possible to discern the potential of a machine which is to say, talk of the kind of environment and the conditions in which it will best express itself if one takes sufficient time to live with it. That's essentially what we focus on when writing for 6moons. But does any of it give an indication as to the intrinsic value of a machine? Certainly not. Assertions to the contrary would be presumptuous and demonstrate a complete lack of discernment. But sufficiently extensive experience can be the beginning of a path that lights the way to recommendations for particular gear combinations which are complementary.